AUSTIN, Texas, December 5, 2016 — High Five Events, one of the largest privately owned event production companies in the United States, is excited to introduce Chikage Windler, CBS Austin Chief Meteorologist, as the official Austin Gives Miles Charity Chaser for the 2017 Austin Marathon® presented by NXP. 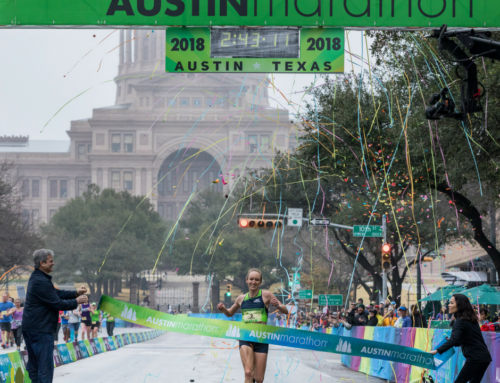 Windler will begin the marathon as the final participant and earn $1.25 for a chosen Austin Gives Miles Charity for every runner that she passes. This is the third year that the Charity Chaser has started as the final participant on behalf of Austin Gives Miles. In addition to starting last and raising money for a charity on race day, Windler will generate awareness for the Austin Gives Miles Program, engage all 27 Official Charities, and help the AGM Program surpass its goal of $500,000. Windler will run on behalf of the charity that wins a month-long campaign that will run from Dec. 14th to Jan. 16th. The selected organization will be determined after calculating donations made during that month-long timeframe, engagement through a social media photo contest, and votes from an online poll. Chikage grew up in a family of runners, but only started distance running a few years ago. She hopes to qualify for Boston someday, or at least have fun trying. She’s the captain of Team CBS Austin, running races across Central Texas with her coworkers. About NXP Semiconductors: NXP Semiconductors N.V. (NASDAQ:NXPI) enables secure connections and infrastructure for a smarter world, advancing solutions that make lives easier, better, and safer. As the world leader in secure connectivity solutions for embedded applications, NXP is driving innovation in the secure connected vehicle, end-to-end security and privacy, and smart connected solutions markets. Built on more than 60 years of combined experience and expertise, the company has 45,000 employees in more than 35 countries and posted revenue of $6.1 billion in 2015. Find out more at www.nxp.com.